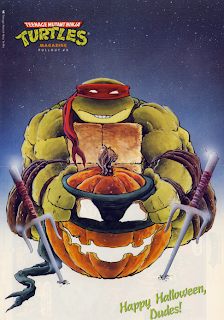 Wishing you a safe and happy Halloween, here's a look at one of the poster pullouts from the old Teenage Mutant Ninja Turtles magazine. This awesome piece comes from the pen of Eric Talbot. While Ninja Turtles: The Next Mutation has yet to see any sort of DVD release in the United States, there has been a series of releases in the UK. However, most of these releases merely regurgitated the first 5 episodes again and again, with occasional releases of episodes 6-11 and no releases of the second half of the series. That is about to change and you will soon be able to own the entire Next Mutation series on DVD. The first 11 episodes are currently available in the UK on the DVD 3-pack pictured above, titled "Turtles Night Out." A second release, with episodes 12-26, is due to be released on November 12. Both DVDs are available to order from Amazon.co.uk, but buyers should keep in mind that these are Region 2, PAL-formated DVDs. North American DVD players and TVs are built to play Region 1 and NTSC DVDs. An innovative person can find a way around this limitation. Thanks to Gobo for keeping tabs on these DVDs. In late 1984, Eastman and Laird met entrepreneur and fan Jeff Rudolph from Hartford, Connecticut. They struck a deal with him to issue a limited edition—of a thousand sets each—of four TMNT buttons. "They were pretty straightforward buttons, in black and white," remembers Laird. "I don't know if he ever sold them all—I know it took a long time for him to sell just half of them." Eastman nods his head in agreement. "I don't think at the time they went over that famously. We put a couple ads in the early issues saying that we were selling them, and it was months and months and months before we sold the last couple sets. The guy had a button-making system at home, where he just got the artwork photocopied and then he hand-colored them with markers, and then numbered them himself." Eastman grins at how primitive it now sounds. "One of those early deals ... that was just a little ahead of its time." Pictured below is the ad selling these buttons; these are the buttons themselves. 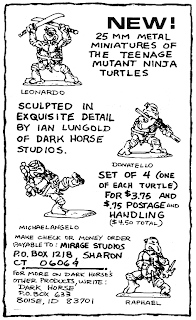 The Dark Horse mini metal figurines were the first TMNT licensed product. Below is an early advertisement. This ad appeared in a handful of the Eastman and Laird comics - this particular scan comes from the second printing of TMNT #2. Dan (the Man) updated NinjaTurtles.com today with an avalanche of information. 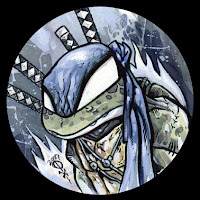 13 new episodes of the TMNT cartoon are now in production for broadcast in the fall of 2008! After months of back-n-forth, all partners agreed on a new direction and the Turtles toon is back on the hot track! We can't reveal any specifics yet, but everyone's favorite Gang Green will be returning to present-day NYC and battling the baddies with their buddies Casey Jones and April O'Neil! This next phase of the show will feature new art direction that will tie the 2003 toon designs into the animated movie style by Imagi! You can read a little more information on this development at The 5th Turtle. This holiday season, Hot Topic will unveil boutiques dedicated to the TMNT retro merchandise and apparel. Hot Topic will have some exclusive items that feature artwork of Krang, Bebop and Rocksteady and will be an ideal place to find the retro merch! Visit HotTopic.com to see what TMNT gear they have currently available. Kurt Adler will be producing Christmas ornaments that will be available at Wal-Mart this holiday season! 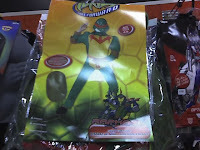 Visit NinjaTurtles.com to get the full scoop on these and other news items. One of the most sought-after (and expensive) independent comics around is Albedo #2, because it features the first ever appearance of Usagi Yojimbo. Imagine flipping through a box of $.10 comics at a convention and finding Albedo #3 and #4, hoping that maybe, just maybe, there's a #2 stuck somewhere in the box, too. I never did find a #2 in there, but I purchased #s 3 & 4 with the hope that maybe their value would be a decent fraction of #2. Unfortunately, they're really not. But it worked out because I still got some cool Usagi content and, big bonus, an old ad for the original Eastman and Laird comics. Not too shabby for $.10. 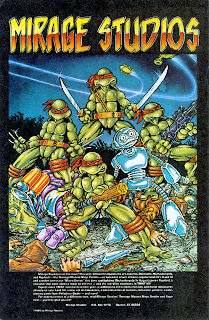 This is a new feature of the blog: TMNT Flashback. Hopefully on a semi-regular basis I will be posting scans of TMNT items of old, with the expectation that there are a lot of people who may not have seen these before and those who have might not have seen them in a long while. This first submission is from New Age Comics #1 (1985) and is an ad for the original Eastman and Laird comic books. Tales of the TMNT #39, featuring art by Andy Tong and a story by Dan Berger, is now available in comic shops and directly from Mirage Studios at NinjaTurtles.com. Playmates Toys' Bigfoot promo figure has been arriving at homes for about the last week. If you haven't yet sent away for yours, be sure to visit PlaymatesToys.com for the details. Dario Brizuela has updated his blog with some colored pages from the Leonardo movie prequel comic, which was previously published in black and white. I'm guessing this is for the UK TMNT Comic magazine publication that has been printing segments of the prequel comics in color for each issue. Time flies. Or in this case, we should say it does roundhouse kicks, wields nunchakus and eats a lot of pizza. 4Kids Entertainment's Teenage Mutant Ninja Turtles are turning 25 in 2009, but the IP owner is getting the celebration off the ground early with a new retro-inspired licensing program debuting at US retailer Hot Topic in November. Building upon the success of the retro apparel program from licensee Giant Merchandising, 4Kids andMirage Licensing have developed a comprehensive TMNT retro campaign based on the art from the original late-80's TV series. TMNT retro boutiques will roll into 700 Hot Topic stores next month, accompanied by a feature page on the retailer's website (www.hottopic.com). Along with apparel, the boutiques will proffer caps, beanies and belt buckles from Bioworld. Other licensees onboard the TMNT retro program include NECA (collectible figures), Etchstar (laser etchings on iPods and laptops) and Disguise (Halloween costumes for TMNT's lead characters), and product will continue to rollout during 2008 and into the 25th anniversary year. Dario Brizuela has posted some art from Tales of the TMNT #38 on his blog. You can checkout the making of the cover and some sample grey-tone pages. Tales of the TMNT #38 is currently available in comic shops, or directly from Mirage Studios at NinjaTurtles.com. 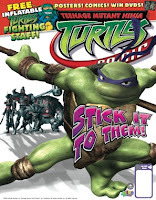 Volume Five collects "Tales of the TMNT" issues 2, 9, 15, 17 and 25. Mystic battles, the fate of Klunk the cat, hot-rodding ghosts from the desert of doom, giant bugs of the apocalypse, a battle royale with the Foot Clan and more await you in this classic tome from Mirage Studios' monster creators, Jim Lawson and Murphy! “The Proposal” - Love is in the air with this special Valentine's Day issue that features the story of how April O'Neil and Casey Jones become engaged! Unfortunately for our heroes, it's not all romance when Casey's no-good cousin Sid (from Tales of the TMNT Vol. 1 #1) turns up with the Foot Clan to spoil the fun and break a few hearts along the way! ! Eric Talbot has updated his blog with a new piece of Leo art. Here's a look at the bookplate you'll receive if you purchase Tales of the TMNT the Collected Books Volume 4 from PanelToPanel.net. 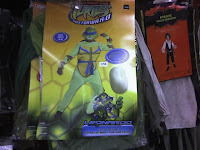 A while ago on NinjaTurtles.com, Dan Berger made mention of an adult TMNT costume that would be available this Halloween. Fan Dorkfish found a picture of this costume a month or so ago, but I was hoping to quietly forget that it existed. Fan tOkKa asked about the costume, so I'm posting the stock photo that was found. I haven't actually seen this in a store, but it's supposed to run around $150. I would recommend finding a better use for $150. London, September 2007 - Teenage Mutant Ninja Turtles Comic have launched a fantastic competition with ITV.com/citv, inviting children to create a villain who will get to battle the TMNT in the comic next year! The winner, as chosen by Titan, will also get a framed picture of their villain, drawn by an official comic artist. There’s also a TMNT Fast Forward DVD for the winner and 3 runners-up, and copies of the comic for all. Shredder, Jammerhead and the Foot Clan have all tried, and failed, to beat the awesome foursome…under 16s who think they can do better can visit ITV.com/citv and download the official entry form. Closing date for entries is October 15, 2007. Terms and conditions are available on CITV.co.uk. Teenage Mutant Ninja Turtles Comic is out every four weeks, priced £2.60. Each issue has a cool free gift, plus all-new comic strips, puzzles and features and news on TV programmes and DVD releases. Issue 6 is out now with a free inflatable fighting staff. Halloween is less than a month away and stores are stocked full of costumes and other goodies. Amongst them you should be able to find some TMNT costumes. It seems that this year there is only the choice of Fast Forward-themed costumes. There is a basic version and a "deluxe" muscle version. Below are camera phone pics of a basic Leo costume and a muscle Raph costume. Today on his blog, Steve Murphy released an image of NECA's preliminary sculpt for their upcoming TMNT series of figures. Here's a glimpse of NECA's first TMNT sculpt submission. 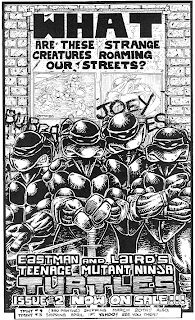 As you can see, it is totally right on with regards to the way the TMNT looked in the first Mirage comic. PL was thrilled too, and had only one minor change to suggest with regards to the neck (not entirely visible here), asking that it be either shortened or thickened by about 20%. The big picture can be found at The 5th Turtle. It's new comic book day and today in shops you can find Tales of the TMNT #38, Raphael: Bad Moon Rising #3, and Tales of the TMNT: The Collected Books Volume 4. If your shop doesn't carry these titles, all three are available from NinjaTurtles.com. 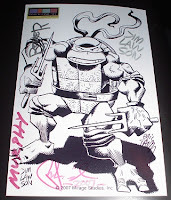 And don't forget that you can get Tales of the TMNT: The Collected Books Volume 4 with an exclusive bookplate drawn by Jim Lawson and signed by the Mirage staff at PanelToPanel.net. Steve Murphy has updated his TMNT blog with some details of what almost became next season's TMNT series. The basic idea behind Overload is that the Turtles, while traveling through time on their return home from the Fast Forward future, briefly get stuck in the past alongside their "kid" selves, and then, thanks to the quantum mechanics of villainous plot shenanigans, all 8 turtles arrive in the year 2008 ("home"). This premise was pitched by 4Kids, approved (apparently with a few minor revisions) by Mirage, but shot down by Playmates Toys, who funds 1/3rd of the show. Playmates then apparently pitched a show that "reached back deeply into the universes of both the original cartoon series and the Archie comics." This was soundly rejected by both Mirage and 4Kids. Which leaves us less than a year out from the '08 Fall season and with no TMNT show in development/production. The three involved parties all seem to have different agendas. Hopefully they can all work together to come up with a concept that appeals to everyone, including fans. Here's a crazy concept: Four giant mutant turtles who study ninjitsu with their giant rat sensei live in New York City and fight various kinds of evil. Usually in the shadows. 'Cause they're ninjas. And they do ninja stuff. New opening and ending theme songs for the Japanese dub of the 4Kids cartoon have now aired on TV Tokyo. CD single information will be posted when more concrete information is available. Thanks to Mendinso for the videos!